Sensitive plant (Mimosa pudica): growing, planting, caring. Did you know? In Latin ‘pudica’ means ‘shy’. Cute, is’nt it? 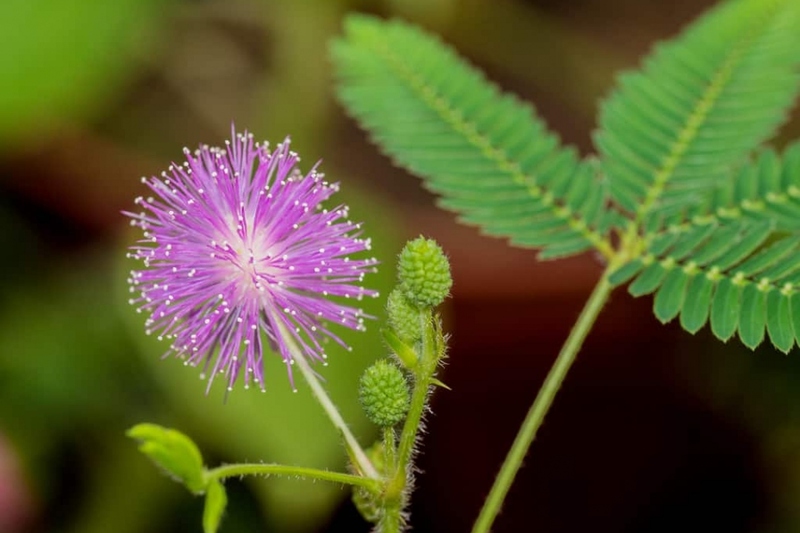 Mimosa pudica - the sensitive plant - is a creeping annual or perennial flowering plant of the pea family Fabaceaee, native to South and Central America. It is well-known for the way its compound leaves fold inward and droop when touched or shaken as if defending itself from harm, and re-open a few minutes later. Mimosa pudica, the shy plant, is a short-lived perennial or a tropical annual native to America, evergreen and bushy. Its leaves measure less than 10 cm, and are divided into four leaflets themselves cut into ten to twenty-five pairs of "segments". The entire leaf folds at the slightest touch. The flowers are spherical, reminding the shape of the dandelion flower, they usually appear in summer, and are lilac or pink in color. Tropical plant, your mimosa will fare well around 20 ° C in a mix of potting soil and earth, inside. Put sand in the bottom of the pot to facilitate drainage. The mimosa likes full light, but beware of the direct sun inside: too close to a window the glass magnifying effect can burn the leaves. Shy mimosa likes air moisture, do not put it in a draft or in a dry room. In season, water once or twice a week. In autumn and winter, the plant is at rest, so wait until the soil dries before watering again, every 8 to 12 days. The touch me not plant lives shortly, so by the end of the summer remember to harvest seeds if you want to reseed! In the spring, sow in a box filled with fine soil, between 18 and 24 ° C, and don't bury the seeds too much. Water every day the first few weeks. One to two weeks after sowing, transplant the seedlings that have already formed two "real" leaves - not counting the first cotyledons - in a temporary pot spacing them by a few centimeters. Water well. 6 to 8 weeks after first transplanting, individually pack the most beautiful plants in a pot of at least one liter.